Peggy Sue and Primm Too . . .
We were hooked up and out on Boulder Hwy. heading to I-15S by 9:15 after a great two weeks here at the Las Vegas Thousand Trails. We were heading for our first visit to the Soledad Canyon Thousand Trails about 15 miles south of Palmdale, CA for a one week stay. Passing through Primm and into California, we saw the Ivanpah Solar Generating Plant off to the right of the highway. 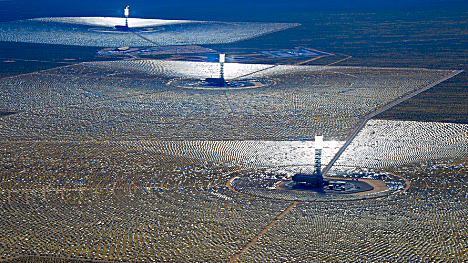 With almost 350,000 mirrors focused on 3 ‘Power Towers’ it generates as much as 390 megawatts . . . on a sunny day, of course. Really impressive. 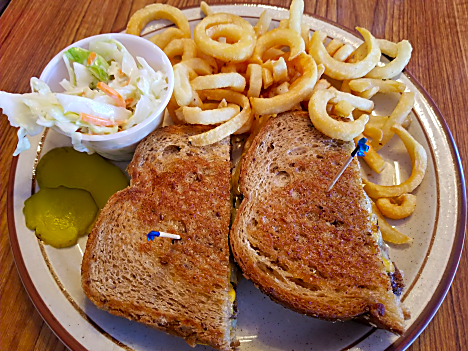 Our one stop along the way was in Yermo, CA, just east of Barstow to have lunch once again at Peggy Sue’s 50’s Diner. 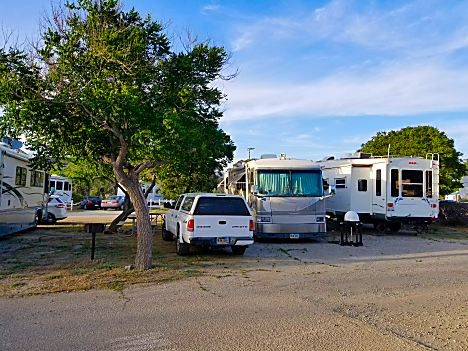 Located right off the Interstate, it is surrounded by two very large parking lots, not only big enough for to park our RV, but big enough to hold a decent size RV Rally. We’ve stopped here several times before and it’s always been good, and today was no different. Peggy’s looks like a 50’s diner, right down the waitresses in their lime-green uniforms right down to those little white hats they wore. 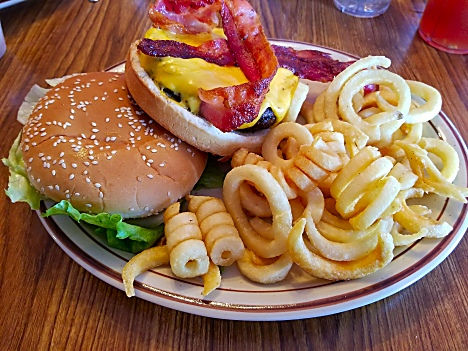 while I had the King Kong Burger with a 1/2 pound patty, Cheese, Bacon, and Curley Fries, as well as a really good cup of Navy Bean Soup with Bacon. 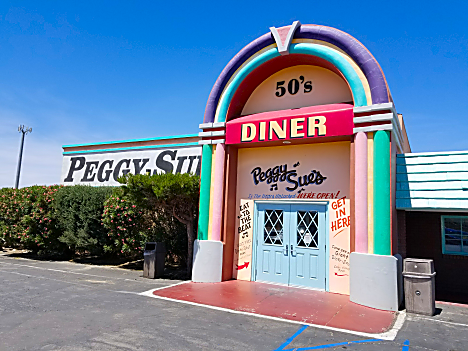 As you can tell from the food names above, Peggy Sue’s is loaded with movie memorabilia, because ‘Peggy Sue’ and her husband both worked in the movie industry for years and collected 1000’s of items that they used to decorate the place. They’re also known for their homemade pies, so we got a couple of pieces to go. 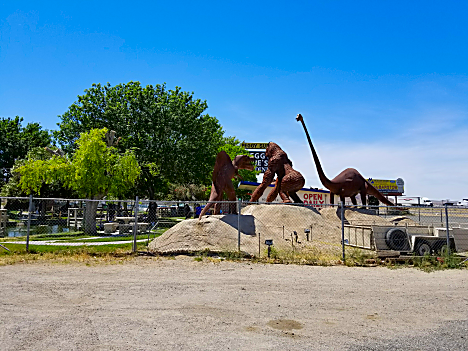 And if you’ve got kids there’s even a dinosaur playground out back. Back on the road, it took us another 2-1/2 hours to make the last hundred miles, mostly due to having to cut over on SR-18 below Victorville to hook up with the Antelope Valley Fwy, just a few miles above the park. We got to the park about 3:30 and only 90 minutes later we were finally parked. Turns out Soledad is one of those parks where they give you a map and let you wander aimlessly until you find a site you like. Unfortunately, for the first hour every site we liked had a small red X on the pedestal, designating it as No Electric, the X being small enough that you pretty much had to get out of your vehicle to see it. We were told that 50 amp was available, but what working pedestals we could find were all 30 amp, and with not 20amp socket to use my AC bypass. Finally I called the office and asked the young lady where all the 50 amp sites were. She said, “There are a of them in ‘B’ . . . but it’s full.” Well that was a lot of help. But with the help of another RV’er we found a nice 50 amp site with trees AND a good satellite view. So we’re set for the week. 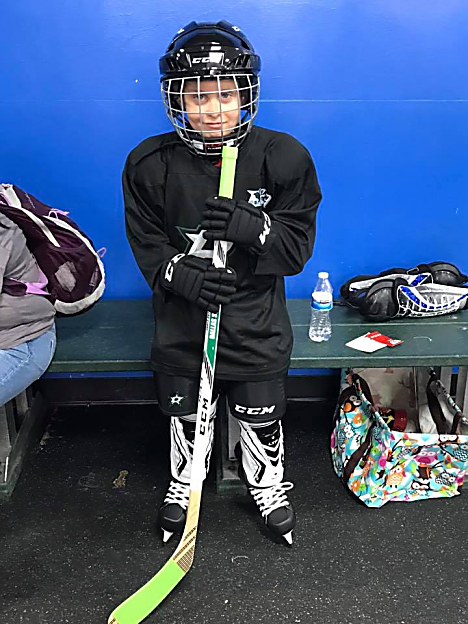 Brandi sent over these pics of Landon’s first hockey lesson. 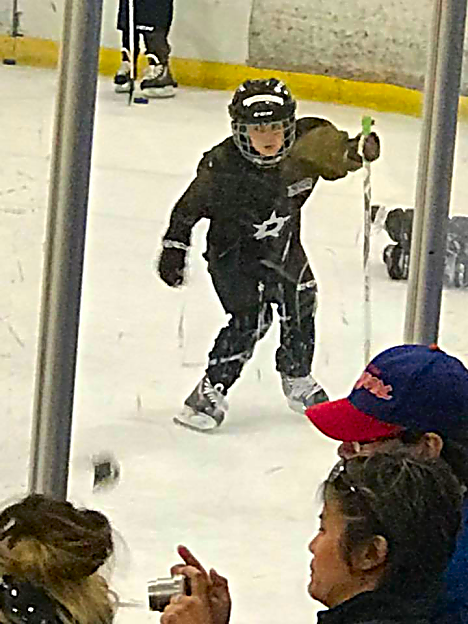 Looks like he’s up on the skates pretty well.